George Gascoigne was born in 1535 to Sir John Gascoigne of Cardington, Bedforshire. He was educated at Trinity College, Cambridge and later enrolled at Middle Temple before becoming a member of Gray’s Inn in 1555. Gascoigne translated two plays that were performed in 1566 at Gray’s Inn, which was considered the most aristocratic of London’s Inns of Court. The plays were ‘Supposes’ based on Ariosto’s Suppositi and ‘Jocasta which is believed to have been derived from either Euripides’s Phoenissae or Lodovico Dolce’s Giocasta. Gascoigne’s translation of Ariosto is believed to be the first comedy written in English prose and used by William Shakespeare as a source for ‘The Taming of the Shrew’. At some point it is believed that he was imprisoned for debt and that his father disowned him, however, Gascoigne himself claims that he was obliged to sell his patrimony to pay the debts that he had contracted whilst at court. Between 1557 and 1559 he was M.P for Bedford but when he presented himself for election at Midhurst in 1572 he was refused on the charges of being ‘a defamed person and noted for manslaughter’, ‘a common Rymer and a deviser of slaunderous Pasquelles’, ‘a notorious rufilanne’, and an atheist. Gascoigne’s own writings were first published in 1573 under the title ‘A Hundredth Sundry Flowres bound up in one small Posie. Gathered partly in the fine outlandish Gardens of Euripides, Ovid, Petrarch, Ariosto and others; and partly by Invention our of our owne fruitfull Orchardes in Englande, Yelding Sundrie Savours of tragical, comical and moral discourse, bothe leas aunt and profitable, to the well-smelling noses of learned readers.’ It was printed by Richarde Smith and the book appeared to be an anthology of courtly poets edited by Gascoigne and two others that went by the initials H.W and G.T. The book is thought to contain courtly scandal and is hinted at throughout with the use of initials and posies with Latin or English tags denoting authors in place of actual names. It was republished two years later with the shorter title ‘The Posies of George Gascoigne, Esquire’ with additions and edits made. 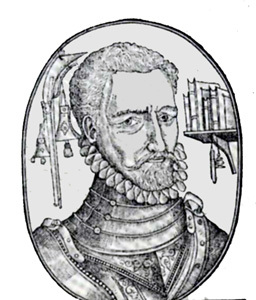 In 1572 Gascoigne sailed as a soldier of fortune to the Low Countries where his ship was driven by bad weather to Brielle, which had just fallen into the hands of the Dutch. There Gascoigne obtained a captain’s commission and was active in campaigns over the next two years including the Middelburg siege. Gascoigne was taken prisoner following the evacuation of Valkenburg by English troops during the Siege of Leiden and was sent back to England in late 1574. He wrote his adventures in ‘The Fruites of Warres’ and ‘Gascoigne’s Voyage into Hollande’ and dedicated them to Lord Grey de Wilton. In 1575 Gascoigne had a share in devising the masques as ‘The Princely Pleasures at the Courte at Kenelworth’ which was in regards to the Queen’s visit to Kenilworth and Robert Dudley, Earl of Leicester. In the same year at Woodstock he delivered a prose speech in front of the Queen and was present at a reading of the ‘Pleasant Tale of Hemetes the Hermit’ which Gascoigne then translated into Latin, Italian and French and gifted it to the Queen the following New Year during the annual gift exchange with members of the court. 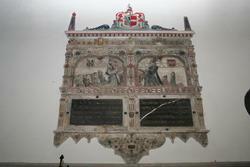 Gascoigne died on 7th October 1577 at Walcot Hall, Barnack near Stamford where he was the guest of George Whetstone. He was buried in the Whetstone family vault at St John the Baptist’s Church, Barnack.